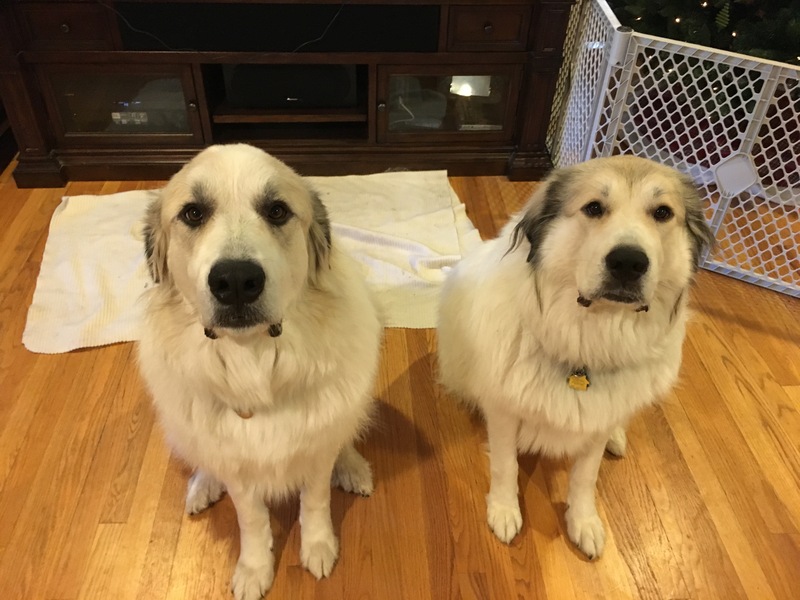 For this session I worked with a pair of two-year Great Pyrenees; Gwen (right) was the guardian’s “problem child” barking, pulling on walks, hard to redirect and most concerning; her reactive behavior to unknown dogs and people. Xander (left) also likes to bark, pulls a little on walks and jumps in when Gwen starts engaging in some of her unwanted behaviors. Their guardians had put up a few physical barricades that prevented the dogs from getting to the area around the front door. While barricades like these can make it easier to control dogs, my goal is to get the dogs to control themselves without the use of any such barriers. After giving the dogs an opportunity to meet me with their noses, I sat down with their guardians to discuss the situation and what they want to do accomplish in the session. It didn’t take long to identify where some of the dog’s unwanted behaviors came from. In addition to inadvertently reinforcing the exact behavior they wanted to prevent, petting the dogs when they violated the humans personal space had also introduced a little jealousy. Each time with one of the dogs saw the other was getting attention, it immediately rushed over and inserted itself in between human and canine trying to claim some of that attention as their own. I used this opportunity to go over a series of escalating consequences and non-verbal communication cues that the guardians can use to better communicate what they do, and do not want from their dogs. It will take a week or two before the dog’s guardians get into a habit of using these consequences and nonverbal cues. Once this is the case, they will be able to communicate with both dogs more effectively and get a better response out of their pets. In time, the guardians will be able to use fewer and fewer of these consequences until a single hissing disagree sound will suffice. Because the dogs had been engaging in competition for their guardians attention, I decided to turn the tables on them and show the humans how they can pet their dogs in a way that reinforces desired behaviors. Petting with a purpose is probably one of the easiest and most productive habits a dog guardian can adopt. Usually within a week or two, the humans start asking the dog to do something before petting them without consciously intending to do so. Once this is the case, the humans will be continually reinforcing the proper leader follower dynamic every time they pet or interact with their dog. To help the guardians practice using the escalating consequences, I walked Gwen through a leadership exercise that I developed a few years ago. The exercise involves placing a high value item on the floor, then claiming it the way that a dog would. Only after the dog walks away and lays down to communicate that they are no longer challenging for the item does the human give the dog permission to claim their reward. It only took Gwen a few repetitions before she seemed to understand the principles of the exercise. Once this was the case I coached one of her guardians through it until she got the same result herself. I could have edited the above video down to show only the successful leadership exercise, but I left the first attempt in because it’s important to understand that you have to always follow through and stick with it when you are working with a dog. After resetting the exercise, Gwen was able to complete it pretty easily. Her guardian was a little bit slow with her initial reactions, but as they practice this exercise her timing and technique should improve. Because Gwen was the “troubled” dog, I wanted to make sure that I walked her other guardian through the exercise too. Gwen’s other guardian was a little bit slow on his reaction when she moved about the room. The exercise is designed to help humans practice utilizing the escalating consequences that we had gone over earlier. In this case, this is the second escalating consequence in which its important that the human pivots to keep the dog in front of them no matter where it moves around in the room. The guardian’s timing should also improve as he becomes more familiar with the exercise. When doing this exercise, it will be important that both guardians step directly at the dog in a very sudden motion anytime the dog gets within 3 feet of the treat. Equally important will be the guardian’s reaction when the dog sits. When the dog moves into a sitting position, the guardian needs to immediately take a large step backwards to communicate that the dog’s sit was a desired action. I suggested that both guardians practice this exercise daily with each dog individually while gradually increasing the length of time the dog needs to wait until each dog is able to ignore the treat for 15 minutes or longer. Once that is the case, then the guardians will only need to return to this exercise for some maintenance if the dog regresses a bit down the road. To help change the dog’s self perception that its ok to bark at or lunge at unknown dogs or humans I suggested the addition of some simple rules and boundaries. Because dogs often relate their authority amongst the members of their pack with the height at which they sit, I suggested that the guardians make the furniture off-limits for 30 days. At the end of the 30 day period, then the guardians can allow the dogs back up on the couch, but only with permission. And only while they are behaving. This makes the couch position a reward as opposed to a way for the dog to compensate if it feels that it needs to bulk up its authority or disagree with being corrected. I always suggest that my clients condition the dog to use a dog bed when they make the furniture off limits. I spent the next few minutes showing the guardians how they can accomplish this with their dogs using a blanket we placed on the floor in front of the TV. As the dog’s continue to find treats and toys on the dog bed, they will start to seek it out and use it on their own. At first the guardians will be using treats to entice the dogs to go to the dog bed. But once they start to do so on their own, the guardians can transition to rewarding the dogs after they do so. In time this practice will allow the guardians to tell the dogs to go their on command. Now we were ready to tackle the dog’s behavior while out on walks. I offered a few tips and suggestions on how to get their dogs into the right mindset before actually leaving on a walk. Many people neglect to address the dog’s behavior prior to heading outside. This is a big mistake and a reason that many dogs are so unruly when out on a walk. We started out with each guardian working with one dog in a one-on-one basis. While it’s always more convenient to work with all your dogs simultaneously, during the training or rehabilitation process it’s always best to work with a dog one-on-one to master the behavior before you start adding conditions that make it more challenging. After a couple of minutes, Gwen was responding very well to her guardian’s new commands and corrections as well as the Martingale collar. Now that the dog and human were on the same page it was time to walk together as a group. Due the time of year, it started getting pretty dark as we were wrapping up the dog walking part of the session. We were about to head back inside when one of the neighbors had an arrival that caught Gwen’s attention. I had Gwen’s other guardian take the leashes and start walking towards the neighbor’s arriving guest. Unfortunately they were so far away that we weren’t able to really use it as a teachable exercise, but I was able to point out some telltale signs that her guardians need to be aware of in the future. For many of my clients, adding rules, boundaries and structure inside flip the leader follower dynamic in such a way that much of the dog’s unwanted behavior outside of the home comes to an end. It’s entirely possible that that will be the case with Gwen and Xander, but only time will tell. By the end of this session, both dogs seemed to be much more cognizant and respectable of their guardian’s personal space and listened to their commands and corrections. They had stopped shoving their heads in their guardian’s directions to demand attention and the guardians were doing a good job of defining their personal space. The dogs were even using the new pseudo-dog bed without being told to. Because of the size of the dogs, I’m glad that the guardians reached out to me for help. Although these are not aggressive dogs, I could see how the reactivity could lead to an unwanted incident that turns bad very quickly. Because both dogs seem to genuinely want to please their guardians and show good attitude and intelligence, it shouldn’t take long for the humans to communicate the new desired behaviors and structure that will be the case from now on. Some minor maintenance and disagreeing will certainly be needed over the course of the next few weeks. But based on how quickly the dogs picked up the techniques and exercises I introduced in the session, it shouldn’t be long before most of these unwanted behaviors dissipate on their own.